RC CLUSTER is closing…Yes I know, I’m sad too. The official closing date is December 18th so if you haven’t stopped by yet you still have a plenty of time left to grab all those wonderful creations. And a lot of the oldie but goodies that have been discontinued are being made available for the closing so definitely make sure to look for those also. Also a different freebie will be offered everyday. Just look for the “Countdown to Closing” Sign. On the 18th there will be a store closing party with games and freebies, everyone is welcome to join. 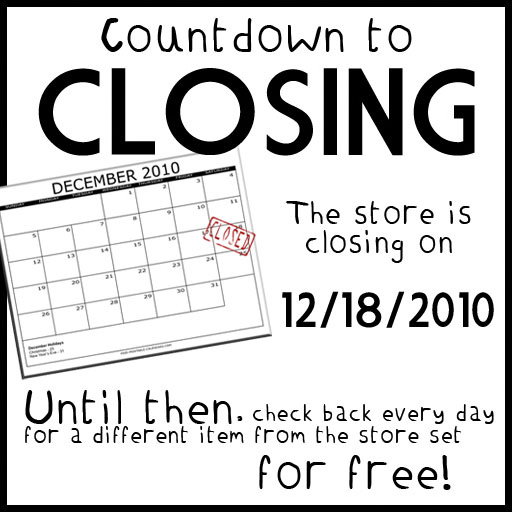 More closing events or freebies may pop up now and then, so keep tabs on the blog! Don’t forget you can buy entire walls of items by purchasing the big gift boxes that point to the wall you’re interested in. Many individual items are on sale throughout the store, just look for the red dots near the posters!